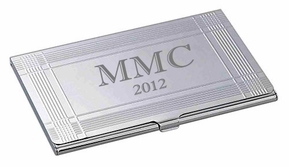 This silver business card case has a high polished silver finish casing with a stylish lined frame for your personalization. Both sides of this silver business card holder can be engraved. Its shiny silver tone will gleam and catch the eyes of all your associates. Each card case can easily carry up to 15 business cards or even up to 6 credit cards.